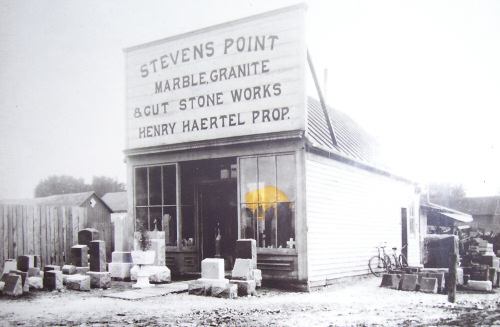 Original photo taken in 1902 of Haertel Stevens Point location. Henry Haertel, Sr. founded Haertel Monument Company in Oak Park, Illinois in 1872. He also established Concordia Cemetery in Chicago during the same era. The Haertels had six sons and Henry trained them to become expert stone cutters. The sons branched out and each opened their own businesses. At the turn of the century, the eldest son, Henry, Jr. came to Stevens Point, Wisconsin and opened his own monument company. Haertel Monument Services was established in 1901. Over the next several decades, the business flourished and expanded. 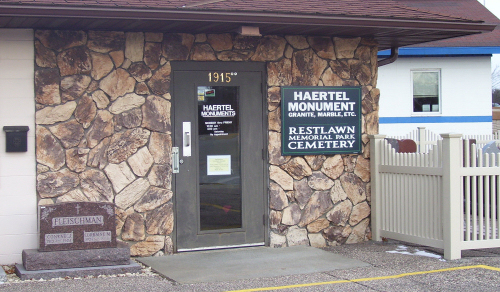 At a high point in the 1930's, there were nine Haertel locations in central and northern Wisconsin. These locations included Ashland, Rhinelander, Medford, Stevens Point, Clintonville, Wisconsin Rapids, New London, Waupaca, and Wautoma. 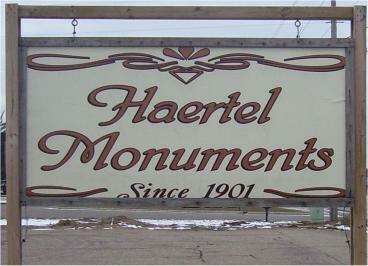 Haertel Monuments established itself as the largest retail monument company in Wisconsin. Henry, Jr. and his wife, June Lee, had two sons, George and Harold. The two sons each continued the family business tradition by overseeing two of the Haertel offices, Stevens Point and Wisconsin Rapids. 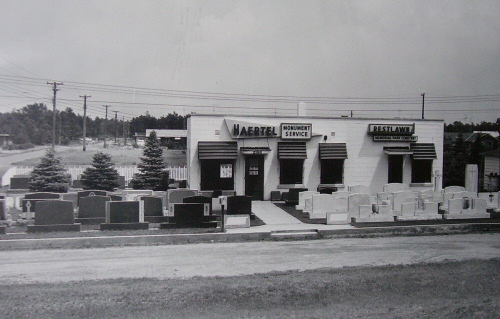 Upon the death of Harold in 1987, the Haertel Monument Company was sold to Mr. Richard Lansing. Mr. Lansing continued to operate the company for almost a decade. In 1997, Pat Daly and Steve Freundl purchased the monument company and continued to operate under the Haertel name. In 2000, the Troosts purchased Haertel Monument Company from Mr. Daly and Mr. Freundl. The Stevens Point location, which was founded in 1901, continues to be the main office. The Wisconsin Rapids location was founded in 1925 during the expansion period and continues to serve customers in the Wisconsin Rapids and Plover area. Haertel Monuments is proud to be associated with the Troost family and their company, Peter Troost Monument Company. We are now part of an award-winning, family-owned business with a network of monument companies throughout the Midwest. Currently, one of its other retail offices is in East Dundee, Illinois. This office was originally founded by Henry's Uncle, Walter Haertel, at the beginning of the 20th century. "Memorials from Haertel Monuments, Inc. have a dimension of extra quality-quality which makes them a source of family pride for years to come. Each is also an exceptional value-available in a wide range of prices, and always worth more! And, although we deal in volume, our careful attention to each production step assures you of a beautiful and durable stone that costs less." Just as the original Haertel family took pride in quality craftsmanship and exceptional value, Haertel Monument Company today continues to be dedicated to fulfilling the individual needs of each of its customers. We invite you to visit our showroom in Stevens Point or Wisconsin Rapids.